Back when Jack Kirby was doing the monster books in the 1950s. I thought they were great. I’d see these books, and the Kirby ones stood out. I’d never seen comics like that before. It made an impression on me. Jack’s, and Steve Ditko’s stuff, just made a tremendous impression. Jack’s work had become somewhat unpopular when I started at Marvel in the mid 70’s. On the one hand, Jack was revered by a lot of the Marvel people; Len and Marv would just marvel at the pages. Basically, the fan in everyone who was old enough to have read FF #1 had this awe of his work and loved it. On the other hand, there was a lot of stuff that just wasn’t quite right about it, and it wasn’t selling. It was a disaster; we had single-digit sales figures for Captain America, and at that time the Marvel line average was up near 50%. Jack’s popularity had declined to amazingly low levels in terms of the new generation of comic book readers. Newsstand readers had a lot of turnover, and new readers coming in weren’t buying it. The San Diego Comic Con used to do this thing where artists would do drawings on stage, and then auction them off to raise money for the con. I remember Jack Katz had set a minimum bid on his of $200, and somebody actually paid $200 for it. Then the auctioneer gets this wonderful, huge drawing of Captain America that Jack had been drawing live on stage, and the auctioneer looks at it and says, “Am I bid $5?” I was so offended; it just cut me like a knife. He, like a lot of fans, didn’t like Jack’s work at that point, and that was his honest assessment of what somebody might pay for this. I offered him $200; I wasn’t a wealthy guy in those days, but I thought, “No way is this selling for less than what Jack Katz sold for.” This auctioneer got so excited that when other people started bidding against me, he wouldn’t let them! So I bought it for $200, and Jack wrote a really nice inscription to me, and I still have it. It’s a fond possession. In 1986, again at San Diego Comic Con, I met with Jack. After that meeting — both Jack and Roz were there — I said, “Y’know Jack, we’re having our 25th anniversary party tonight. It would mean a lot to me if you would come.” He said he’d see, and Roz didn’t look too happy about that idea. Anyway, the party’s in full swing in this huge hall in the U.S. Grant hotel. Stan and I are standing way in the back, fairly near the doors. All of a sudden I look up, and in the door come Jack and Roz. I ran over to them and shook his hand and escorted them over to where Stan was standing. I have to tell you, it was Stan Lee’s finest hour. Just a moment before they arrived–you know how Stan does the big gesture sweeping his hands around? He had a glass of wine in his hand, and he whacked it against a pillar, and the glass broke, and his hand was slashed; he was bleeding buckets. So here’s Stan; he’s got his handkerchief pressed over his right hand, bleeding, probably going into shock, and I walk Jack over. Jack sticks out his hand, and this panic goes over Stan’s eyes. He sticks out his hand, and Jack shakes his hand — and then Stan has to wipe the blood off of Jack’s hand with his handkerchief. He’s clutching this handkerchief in his right hand, having this conversation with Jack, and it was a really cool moment. Obviously these guys hadn’t had a real chat for a long time, and I felt privileged to witness it. He invited Jack to come up to his house, and Jack said, “Why don’t you come down?” It was really cool; I felt like they were becoming friends again after a very long estrangement. Then Stan says, “Just once more — I don’t care who owns it or gets credit — I’d like to do a story with you sometime. It doesn’t even have to be Marvel; you can publish it.” And Jack said he’d like that–and Roz said, “Bite your tongue.” Then she kind of led Jack away, and that was the end of that. I at least felt good that Jack had come to the 25th anniversary party. He was mobbed; people just swarmed him. That was very nice. is it your intention to paint roz kirby as some sort of yoko ono? so while jack was begging marvel for his original art, and both stan and you refused to help him…he chose to hang with you both at a party like nothing was happening? I think that in the 70's, people were so used to having Jack around that they took him for granted. I've read the letters pages in some of his 70's Marvel titles like Cap, Eternals and Black Panther and he definitely gets a lot of negative feedback. It seems to me like a case of too much of a good thing. These guys had grown up on his stuff and his style at Marvel was kind of omnipresent, and if it wasn't him drawing a book in a lot of cases it was someone drawing just like him, and then in the 70's you had guys like Starlin and Barry Smith which for the fans were a new style and a kind of a breath of fresh air, and they didn't want to go back. They were like teens who've gotten do drive and have some freedom for the first time, and now they don't want to go to grandma's house every sunday with the rest of the family. I didn't get into Kirby until the early 90's when I was in my early 20's. I ate up his 70's stuff. The time was right for me to discover and fall in love with it. I understand how the kids didn't want it at the time, but I wish they hadn't been so mean about it. Anyway, I see every Kirby issue as gold. Absolutely loving this blog – have just put a link to it on my own. More stories like this please. May I ask a question? I got the impression that John Bryrne (whose FF stuff I adore) seemed to have a problem with you back in the day. Did he ever resolve his difficulties with you, and do you ever see or hear from him now? Finally retrieved from storage the HUGE Cap drawing done by Kirby. He signed it and wrote "To my good friend, Jim." Having it reframed. Picture soon. You should read what Mark Evanier has written about Roz, It paints a picture of what I think she really was like. It seems she was Jack's fierce protector and support system. I've known a few amazingly talented folks with wonderful wives who basically gave them the support they needed to allow them the comfort zone their genius could flourish in. I met Roz and Jack in 1982 and he was charming, though he had memory problems then. My take on it was that Roz was very much Jack's cornerstone and his safe harbor. Everything I've ever heard has only served to support that intuition. Thanks for the quick answer, just found this blog yesterday,thanks for so many great stories over the years. Because there was still one Kirby legal action pending I was forbidden to say anything and after I left Marvel I didn't do any interviews. This is a great story,but why are we only hearing about it now? This story takes place in 1986,when relations between Marvel & Kirby were at an all time low. It would have been nice to hear about this when it happened. It shows that despite professional/legal differences, you could still get along and respect one another. Plus,this story would've been good PR for Marvel,which it needed at the time. @Piperson "What do you mean single digits? like 1-9 issues?" In those days, newsstand comics were returnable. I'm guessing Jim means that 90+% of the copies were being returned unsold, as opposed to 50% being returned for other titles. Keep in mind, though, that 10% of a print run back then would still put the book near the top 10 of today's sales chart. 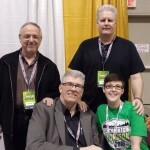 Jim – Thank you for this blog and the kirby story. It was Kirby who get me hooked on art and perspective and the dynamics of movement. Thanks for keeping the spirit alive. This is a wonderful story Jim! So Jack was working at Marvel but Stan and Jack weren't on speaking terms? What do you mean single digits? like 1-9 issues? Didn't Stan and Jack do the Silver Surfer graphic novel at that time? How does this work into this story? Reading this blog is a guilty pleasure that I thoroughly enjoy. Thanks for taking the time. Read tomorrow's post. It will explain a lot. Jim, heartbreaking story. I think Jack's departure to DC hurt his popularity, being placed on a 2nd tier book like "Jimmy Olsen" must have looked like a demotion to his fans. New Gods was great, but quickly canceled and then Jack was reduced to a Planet of the Apes rip-off called Kamandi and some other half-hearted material. By the time Jack returned to Marvel most of his earlier fans had probably discovered girls and moved on, and the new Marvelites were into John Buscema or whoever. Later, when Kirby could really make some money with creator owned projects his abilities were beginning to fail him, it just seemed like he could never catch a break. Is there any truth to these rumors that people in the Marvel offices were calling him "Jack the Hack" and trying to fill his letter columns with knock letters? Great stuff as usual, thanks for telling these stories. I love the Kirby kreature books. DC tried to imitate them, but none beat the real fantastic four: the pre-hero JOURNEY INTO MYSTERY, STRANGE TALES, TALES OF SUSPENSE, and TALES TO ASTONISH. (Add the short-lived Kirby runs in WORLD OF FANTASY, STRANGE WORLDS, and AMAZING ADVENTURES for a super seven.) Stan Lee and Steve Ditko were also turning out fine work in AMAZING ADULT FANTASY – TWILIGHT ZONE for twelve cents. I'm glad that Marvel reprinted most of those stories in the early 70s and is still reprinting them today in MASTERWORKS format. I also consider Kirby's 70s Marvel work to be a highlight of that period. I have complete sets of his return to CAPTAIN AMERICA as well as 2001, MACHINE MAN, and DEVIL DINOSAUR. I'm sorry to hear his CAP wasn't selling well. Did his covers affect sales in the 70s? There were a lot of Kirby covers back then. My first regular AVENGERS issue (#156, which you scripted) had a Kirby cover. I wonder if readers liked his covers but were less receptive to his writing. Thanks for sharing the San Diego stories. The first one is shocking. Did that occur when Jack Katz' THE FIRST KINGDOM was coming out? The second one is heart-warming. Kirby is a gentleman. You've worked with some of the greatest artists in comics. Do you ever wish you had worked with Kirby? What was Roz's problem with Stan? Thank you for these stories Jim. I'm a big fan of yours and this is an incredible inside view to some of the biggest days in Comic History! Reading your stories are like watching a kid in a candy store. I probably cannot even fathom the sort of feeling you had meeting your idols like this, let alone, being able to tell tremendous stories about them later on. When do I get to do this with you?